Beginning in Autumn, thousands of hawks commence a southward migration in search of milder climate and more plentiful prey. Along a route that for some raptors may extend from Canada to South America, the Marin Headlands (specifically, “Hawk Hill”) is well known as an excellent location to observe this migration. For 25 years, the Golden Gate Raptor Observatory (GGRO) group of volunteers has been tabulating the annual fall migration of birds of prey. GGRO commences their count in mid-August each year. Check out their website and the “Daily Hawk Count” for current reports (www.ggro.org). Even on a “slow” day, the GGRO Hawkwatch team has counted 155 raptors at the rate of about 26/hour! Hawks are visual navigators that prefer to fly over land, often times following the coastline. 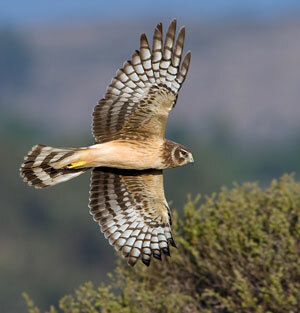 So it’s not too surprising that hawks are frequently spotted riding the strong winds along the rugged San Francisco and San Mateo coasts. And where there are open fields, opportunities to observe hawks hunting can be almost a sure thing. Who hasn’t seen one of these large birds of prey (up to 3 lbs.) perched along a highway? One of my favorite locations for raptors is Half Moon Bay –specifically in the open fields of Bluff Top Coastal Park and at Wavecrest Open Space and the adjoining northwest area of Wavecrest Rd. /Hwy. 1. During the last four months of the year, it would be difficult not to find hawks in these areas. A good pair of binoculars can be a big help when it comes to studying these birds in detail.